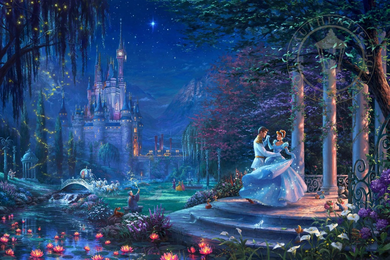 Thomas Kinkade Disney Limited Edition:"Cinderella Dancing in the Starlight"
About the Art : When Disney released the film Cinderella in 1950, instantly it became the new gold standard for music, animation, and visual storytelling. The American Film Institute immediately considered it one of the best American animated films ever made. Now this wonderful story of love, loss, struggle, and �happily ever after' has been recreated in this vividly colorful painting like never before by Thomas Kinkade Studios in Cinderella Dancing in the Starlight, the second piece of the collection entitled, Dancing in the Light. When the clocktower strikes midnight, Cinderella's magical night with Prince Charming, along with her dreams of a better life, seem to be coming to an end�or maybe, it's just the beginning. This romantic scene takes place beneath the shadows of the weeping willow trees on the garden gazebo under the starlit sky. Cinderella's beauty is such that her closest friends, Gus and Jaq stand watching in amazement, and even Lucifer, the cat, is mystified. The presence of the birds above her in the trees reminds us of Cinderella's song "Sing, Sweet Nightingale." As Cinderella's magical ball gown twirls, it sparkles from the light of the shining stars.Together she and Prince Charming dance the night away. The approaching stagecoach can be seen racing in from over the bridge, as the Fairy Godmother and Bruno stand by watching in amazement. Hidden into the backdrop is a small bench where Cinderella once sat, sad that things may never get better until a woman in a light blue cloak appears.. Not far from there, Lady Tremaine, the wicked step-mother, along with her viciously bitter daughters look on with jealous intent. Finally, the glass slipper is left on the steps, the only clue that will reveal the true identity of this beautiful maiden, Cinderella.. For as the story goes, Cinderella has found her one true love and her life will never be the same.